The Do It Scared podcast started with one idea…helping others find courage in the face of fear. It was meant to inspire listeners to put one foot in front of the other and move past fear to create a life they love. 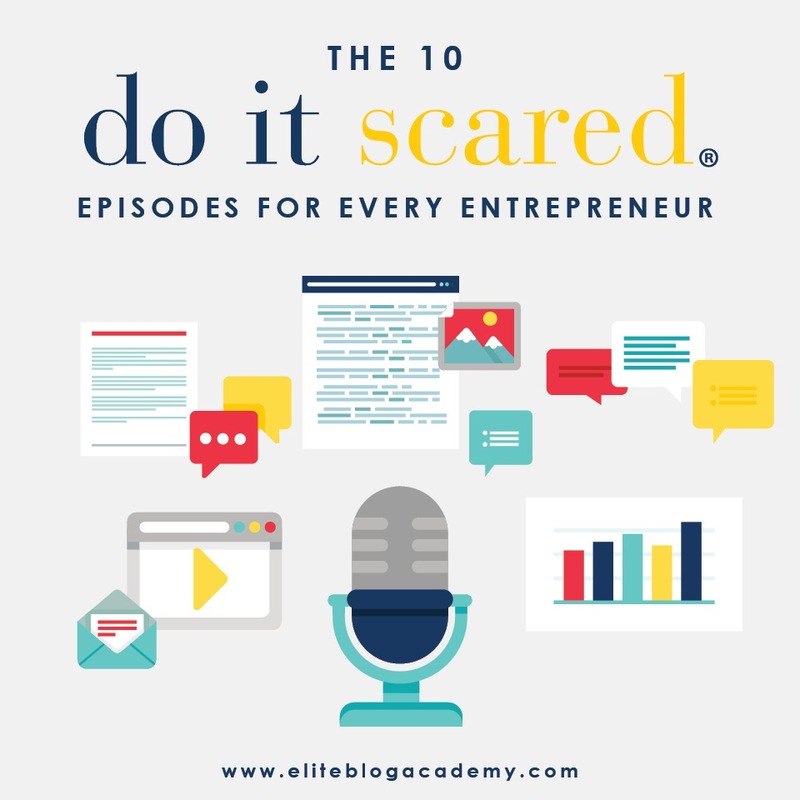 With over 800,000 podcast episode downloads rounding out our first year, it is clear that Do It Scared inspires our listeners to find courage in the face of fear and for many of you, some of the episode takeaways have been life-changing. From stories about people overcoming all the odds to lessons on entrepreneurship, the Podcast has nurtured you as bloggers and online business owners with incredible stories and straight-talking tough love and continues to inspire you all to do it scared in your own lives. “Being in EBA with Faith and watching her progress, passion, and success has been so motivating for me. It’s great hearing from the alums such as Rosemarie and Jennifer, but Faith makes my goal feel more attainable. I know that because of EBA, bloggers such as Faith and myself will achieve success in our businesses. “ -Maxiann M.
“#44 and the statement ‘My success is inevitable’ was a game changer for me.” -Christi R.
If you’ve ever dealt with anxiety, feeling stuck, or worry about taking the next step in your business (and let’s be honest, don’t we all feel those things sometimes? ), this is the episode for you! Faith is a true inspiration who will help you deeply realize that you really can create the life you want. In episode 46, Ruth spoke to DIY blogger extraordinaire Jennifer Marks (of Jennifer Maker) about turning your passions into profit, and daring to go above and beyond to protect the people you love. Jennifer shares amazing craft tutorials that have garnered her a huge tribe of raving fans. Ruth’s known her since her blog was tiny, and it’s been amazing to watch her transform it into something that’s making her almost seven figures. But, Jennifer didn’t do all of this just for herself. Her daughter has a serious medical condition and needed $50,000 for a specific treatment. Jennifer was able to pay that bill thanks to her blogging income. “#46 with Jennifer Maker. I love how she explains her ups and downs. It just shows me yes I can make it. Even if you are scared!!!! !” -Gina P.
“Episode 46 Jennifer Marx it was very inspiring. How she was able to build her business in a very short time. About how she took a change and now she is living the life she dreamed of. This is my goal. This really spoke to me about perseverance and just staying on course even when it seems so hard sometimes.” -Manjula W.
The New York Times bestselling author Michael Hyatt joined Ruth for episode 50 to talk about being free to focus, and how to win at home and at work. Michael is also an entrepreneur, speaker, and podcaster, who’s passionate about helping leaders succeed in all aspects of their lives, and he’s packed with insight on productivity and getting things done. In this episode, Michael digs deep into this and other productivity tips, and touch on how they can relate to people of different ages with different lifestyles. “He talked about how he eventually succeeded even after he filed bankruptcy. He stuck with his dream and made it happen! So encouraging. He and Ruth had such parallel stories. It was really interesting to hear the similarities. “ -Jillian B. “I also really liked #50 with Michael Hyatt and his ability to focus and make huge changes no matter what your age. I like that he tries to work no more than 40 hours a week and appreciate how he states his wife is a huge part of his success because of her support. His spouse helps his focus.” -Pamela R.
There’s a pretty big difference between those who succeed and those who don’t, and it has nothing to do with how much money you have, how well-connected your family is, or how good your grades were in school. Instead, it’s having the grit and persistence to keep going no matter how hard things get. In episode 27, Ruth let her vulnerability shine as she shared her own journey with depression and the things that are hard for her to talk about even now. This episode is all about finding the grit and gumption to persevere, three critical steps you can take in the right direction, why it’s so important to accept responsibility for yourself, and how refusing to quit can shape a life you’ll love. “Ruth’s episode on how she struggled with depression and attempted suicide. It was really powerful and I listened to it several times.” -Melissa W.
“I loved the episode where Ruth talks about her struggles with mental health!”– Faith M.
How to embrace your mistakes as lessons instead of running from them. This episode highlights one of the most important skills you can ever learn. Making a mistake is a huge source of fear for so many people. In fact, it’s the most common thing that holds people back and keeps them stuck. “Embracing your mistakes! I love the idea of reframing mistakes into lessons and not letting them hold you back or impede your progress. Such an important reminder!” -Cat H.
The amazing Gretchen Rubin, author of The Happiness Project and many other books, joined Ruth on Episode 38 for a talk about discovering who you are so that you can become who you want to be. In this episode, Gretchen spoke about why it’s so important to accept yourself as you are, and then use that self-knowledge to build a better life. She also talked about why it’s so important to figure out what the real problem is before you start working on a solution, and how you can use your natural tendencies to create a life you’ll love! “Episode #38 with Gretchen Rubin was fantastic. Understanding motivators was very impactful in helping me understand why certain things get done and others don’t. Combine it with my fear archetype which I learned last week and I will always set my goals/dreams/needs aside. Between these two revelations, I now have a framework of understanding with which I can make changes and move forward.” – Jennifer N.
through on the goals I set for myself. Since hearing that episode I have set up a lot of outer accountability for the things that I want to do and it has helped tremendously!” -Krista S.
In episode 6, Ruth brings in the brilliant blogger and wildly successful entrepreneur behind The Busy Budgeter and the 90 Day Budget Boot Camp, Rosemarie Groner. She is an awesome woman who had the courage to pursue her big dreams and is brave enough to admit that success isn’t always as glamorous as it sounds. Rosemarie has had a lot of curveballs thrown at her recently, and the wisdom that she has developed along the way will inspire you to take action in your own life. “I have two: Rosemarie Groner and Tasha at Designer trapped. They both inspired me because I need to become debt free and redecorate and design my house in a way I love, on a budget of course.” -Christine M.
In episode 6, Rosemarie focuses on how she turned her fear into her motivation for success, whether she follows (or breaks) rules, what the best piece of advice she has ever received is, how she practices self-care, and much more. In episode 14, you’ll hear a conversation with lawyer-turned-designer Tasha Agruso about achieving great things, and then daring to walk away. Tasha is hilarious, brilliant, and very talented. She founded the wildly popular website Kaleidoscope Living and created the Designer in a Binder. She’s a former medical malpractice attorney who harbored a secret dream to become an interior designer. Luckily, she didn’t allow this passion to remain just a dream! Instead, she turned it into a multi-six-figure online business. Her story is so inspirational because it shows you that no matter how far you’ve gone down one path in your life, it’s never too late to find a new one. “For me, it’s definitely Episode 14 with Tasha Agruso on Why Being an Overachiever isn’t all its cracked up to be! Tasha’s bubbly personality, her message, her quotable quotes (“I wanted to be a giraffe…I was VERY weird.”) – all add up to a delightful episode I have listened to on my commute more times than I can count. But, more than anything – it’s her Achiever strength that resonates with me the most, because I too am an Achiever (and a Procrastinator!) and this episode has such good relatable reminders in it. I keep telling my kids, “We’re just in the messy middle right now”, like that should make total sense to them. :)” -Jennifer S.
A lot of people struggle with the downward death-spiral of comparison and self-doubt. This happens when we start looking around and comparing our place in the world to the people around us. We doubt ourselves, then start comparing more, and doubt ourselves even more, and so on until we’re stuck in this awful loop. The world seems darker, and we start to leave our fire and courage. “One of my favorite episodes has been episode #43 on comparison. I loved strategy 3 & 4 where she talks about putting your blinders on and changing my mental script! Both of those strategies have come in handy while going through EBA!” -Elizabeth G.
“[My favorite episode was ] The one about the Miracle Morning with Hal Elrod. I immediately got the book and love putting the MM (Miracle Morning) into practice.” -Michelle S.
The Hal Elrod episode was a game-changer for me! Of course I’m going back to listen to each and every one of them!